Colombo International Container Terminals (CICT) reported a throughput of two million teus for the 12 months ending 31 December 2016, achieving year-on-year growth of 28 percent in volume. This new volume enabled the Port of Colombo to register overall incremental growth in the three consecutive years since CICT came into operation. 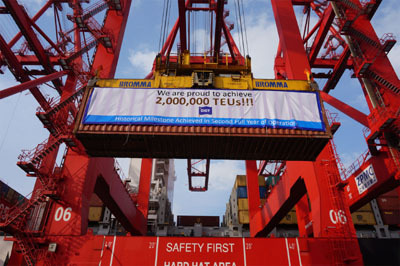 Announcing the milestone achievement, CICT said ULCCs (Ultra Large Container Carriers) and VLCCs (Very large Container Carriers), many of a size that only the Colombo South Terminal is capable of handling, had contributed 70 percent to the volumes it achieved in 2016.